Elmira Pet Products' CEO Bryan Cook (left) and Township of Woolwich Ward 1 Councillor Patrick Merlihan (right) dump the final shovels of soil at the base of one of the fifteen maple trees planted to celebrate #CANADA150. This year Canada turned 150 years old. This momentous occasion was celebrated by Canadians from coast to coast on July 1st; a day that you could truly feel our country was united. People celebrated in many ways including gathering on Parliament Hill in Ottawa, attending firework displays, participating in backyard BBQs, spending quality time with family, watching numerous events from across Canada on TV and many more. Elmira Pet Products is a proud Canadian company. We have roots in Elmira, Ontario that date back to 1923 and our current logo even features the iconic maple leaf. It has become a Canada Day tradition for our staff to join together and celebrate the occasion with a delicious lunchtime BBQ. For a country that has provided us such ample opportunity to thrive and succeed, this year we felt that it was only fitting that we honour #CANADA150 in a unique and special way. We set out to find a way to celebrate that benefitted the community, our facility, our employees and the environment not just today but for years to come. 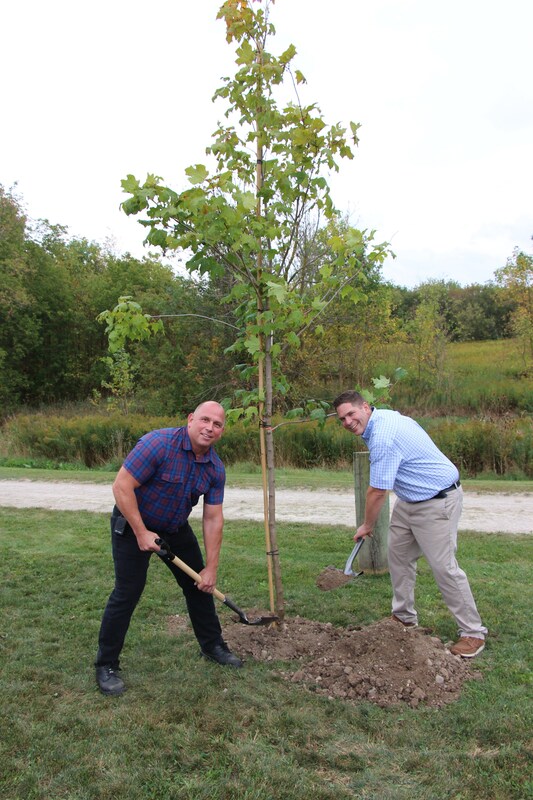 We are proud to announce that on Wednesday, September 27th Elmira Pet Products planted 15 maple trees to honour the 15 decades of prosperity our incredible country has enjoyed. Waiting for this autumn date not only provided us ideal planting temperatures but also enabled us to align this special event with National Tree Day. The maple species we selected for planting include the Green Mountain Sugar Maple, Autumn Blaze Maple, Royal Red Maple, Princeton Gold Maple and Regal Petticoat Maple. We chose to plant maple trees for a number of reasons. Planting three each of these five types not only provides a beautiful mix of colours throughout the year but also represents the diversity of people in our country. Known to many Canadians, the maple tree is our national tree and the maple leaf is featured prominently on the Canadian flag. Maple trees are very hearty and at least one species of maple tree grows naturally in each Canadian province. Maple trees also hold a special place in the heart of the residents of our home, Elmira. Since 1965 Elmira has organised the Elmira Maple Syrup Festival, recognized by the Guinness Book of World Records as the World’s Largest Single Day Maple Syrup Festival. Without the ample maple trees (specifically sugar maples) that thrive in our area, our town would likely be much different and have an entirely different history. The approximately 80 Elmira Pet Products day shift and office employees attending the #CANADA150 Tree Planting ceremony enjoyed the beautiful autumn weather and a piece of appropriately coloured red and white cake. After picking out which trees we wanted to plant we needed to decide where to plant them. We are lucky enough to have our facility located directly beside the Kissing Bridge Trailway; a 45 km trail that travels through rural communities, rivers and wetlands in our area. Our employees can often be seen walking the trail during their lunch break and enjoying the beautiful scenery that surrounds it. We strategically decided to plant along the stretch of trail that passes beside our facility, marking the first of the 15 trees with a sign that trail users can interact with to learn more about the trees and the planting project. As the trees grow, their leaves will provide beautiful colours and shade for trail users and our employees who may want to enjoy their lunch outside. Elmira Pet Products has always been conscious of the environment and is continually making strides to reduce our ecological footprint. We take our commitment to the environment seriously and are consistently finding ways to increase recycling, minimize waste and improve sustainability efforts. Planting trees to celebrate #CANADA150 brings with it numerous benefits to the community and our employees, but primarily it provides a great way to clean the air, cool the environment, reduce surface water runoff and create habitat and food for insects, birds and other animals. Canada is a green, clean and beautiful place to live and work and we intend on doing our best to maintain this for generations to come. The trees we planted will act as a living time capsule, growing larger and stronger as the years pass, just as our country and company will. As we look back at how far our country has come over the past 150 years, we also look towards the future and seeing how our country and company will grow and thrive in the True North, strong and free.